Sarah Crichton Books, 9780374280093, 416pp. America’s national parks are breathing spaces in a world in which such spaces are steadily disappearing, which is why more than 300 million people visit the parks each year. Now Terry Tempest Williams, the author of the environmental classic Refuge and the beloved memoir When Women Were Birds, returns with The Hour of Land, a literary celebration of our national parks, an exploration of what they mean to us and what we mean to them. From the Grand Tetons in Wyoming to Acadia in Maine to Big Bend in Texas and more, Williams creates a series of lyrical portraits that illuminate the unique grandeur of each place while delving into what it means to shape a landscape with its own evolutionary history into something of our own making. 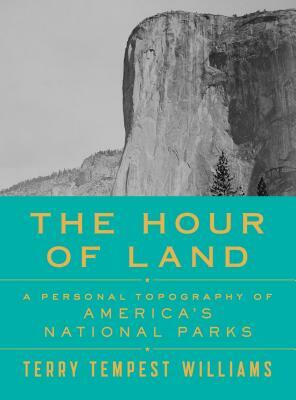 Part memoir, part natural history, and part social critique, The Hour of Land is a meditation and a manifesto on why wild lands matter to the soul of America. Terry Tempest Williams is the award-winning author of sixteen books, including Hour of Land: A Personal Topography of America’s Parks; Refuge: An Unnatural History of Family and Place; Finding Beauty in a Broken World; and When Women Were Birds. Her work is widely taught and anthologized around the world. A member of the American Academy of Arts and Letters, she is currently the Writer-in-Residence at the Harvard Divinity School where she divides her time between Cambridge, Massachusetts and Castle Valley, Utah.